What’s going on in your pantry? Is it dark and moody, laden with shadowy secrets – long-expired lentils, non-identifiable nuts and prehistoric pasta? Sounds to us like it’s time for a pantry makeover. A happy pantry is a healthy one. The better your pantry looks, the easier it’ll make it to find things – and the sooner they’ll be used. 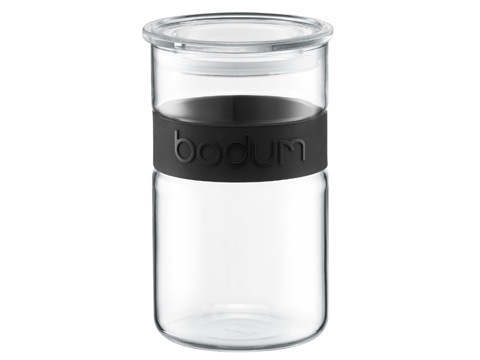 Bodum’s Presso Storage Jars are just what the pantry-doctor ordered! You’ll be im-presso-ed by Bodum’s Presso collection. These simple, stylish glass jars are perfect for your pantry. You can see what’s inside at a glance, and with a non-slip silicone band around the middle, they’re easy to grip. The airtight lids are made from clear acrylic, which looks just like glass, but won’t break if the lid of your canister should happen to fall from your bench. How clever! Give your pantry a new whole new lease on life with a little help from Bodum Presso Storage Jars. It’s like magic for your pantry. Hey, presso!